Des Moines, Iowa, US - Police are alarmed about an increase in anti-government wheatpasted posters and graffiti. One of the posters that authorities found particularly alarming encourages readers to "Punch cops in the face and get away with it...If you treasure liberty - if you hunger for justice - if you crave revenge - join the Anarchists." That and some of the other propaganda advertises the website of the anarchist group Crimethinc. Lt. Mark Morgan of the police intelligence unit says that the messages may represent a viable threat and are being taken seriously. 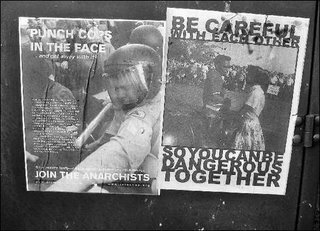 A hand-written messages in yellow marker that read: "Make it all crash & let it all burn" was discovered near another anarchist poster. Officials said a power washer will be needed to remove the messages. "We're not surprised these posters showed up where they did," Morgan said. "We've seen them downtown before. It's not a huge trend or anything, as far as we know. So it's difficult to know what their beliefs are. If they're like a lot of these other groups; they have a few people who know what they are talking about and others who are just looking to join a group at all."